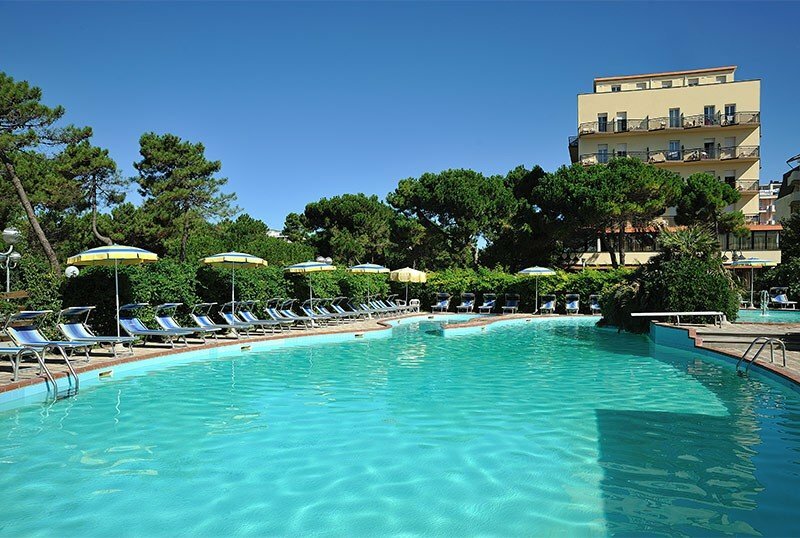 The Hotel Ausonia is a 3-star hotel in Milano Marittima, near the sea with parking, swimming pool adjacent to the structure, private beach, tennis courts, restaurant, free WI-FI connection. Accept medium-sized animals. The hotel is located in a very convenient position, a stone's throw from the sea, on a pedestrian path leading to the private and equipped beach. Around the large pine grove of Milano Marittima develops. All rooms have a balcony with sea view (lateral), independent air conditioning, digital terrestrial TV, WI-FI, safe, telephone, bathroom with shower or bathtub, hairdryer. 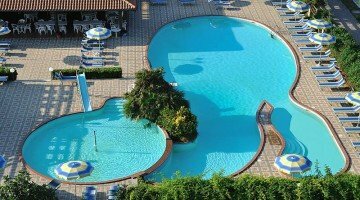 The hotel has a garden, swimming pool, sun terrace, tennis court, reading room, lift, beach towel (all inclusive). Animation from June to September, light lunch on the beach or in the pool, soft drinks in the pool from 10 to 18 (full board). PETS: animals of medium size are admitted free of charge. BREAKFAST: sweet and savory buffet with fresh pastries, yogurt, cereals, juices, cheeses and cold cuts. LUNCH: 3-choice menu, buffet of appetizers and vegetables, drinks and coffee with meals. Possibility to have a buffet lunch in the pool. DINNER: 3-choice menu, buffet of appetizers and vegetables, water, wine, drinks with meals. In the hotel: children's pool, entertainment, paid baby sitter. In the garden of the Adria hotel, adjacent property of the same property, there is a swimming pool with a hydromassage area, a trampoline, a pool for children with a slide, a rescue service, a sunbathing area and a bar service. The hotel has a private bathing establishment (Gabbiano and Deanna baths), which offers guests an umbrella and two beds per room, from the fourth row onwards.